I actually don’t listen to music while I’m writing. I know so many people do – my husband does – but I find the words of the songs distract me from the words in my head. I can write in a very noisy room, which I think comes from working in newsrooms for years, but I have a hard time writing with music playing. The time I do listen to music, though, is when I take walks and think about my books. I try to take a walk most days – usually around Rittenhouse Square not far from where I live – and I work through plot points and character’s motivations. I always take my iPod and I listen to my 14-year-old daughter’s playlist. I would say I do it to channel my inner young adult, but that is only part of it. I really like the music she listens to. Here are ten songs at the top of the list right now, but keep in mind they change all the time. Two years ago I would have mentioned songs by Justin Bieber, one year ago One Direction, always a little Glee. Here are the ones I love right now. 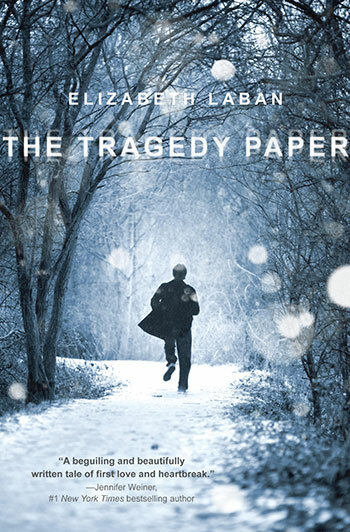 The Tragedy Paper by Elizabeth LaBan was released in paperback though Random House earlier this month. The hardback was published is January, my review of the book can be read here. Find out more about The Tragedy Paper by visiting Elizabeth LaBan’s website.